River Valley Charter School is a regional public Montessori school serving students in grades K-8 from the towns of: Amesbury, Newbury, Newburyport, Salisbury & West Newbury. 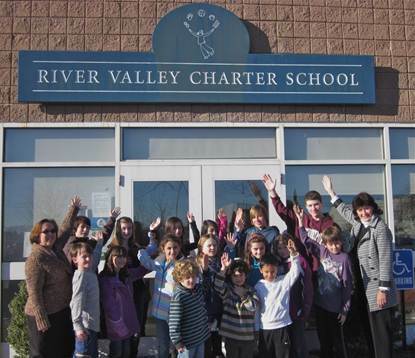 The River Valley educational program is based on the Montessori philosophy and methodology helping to educate and inspire students to reach their full potential with a focus on critical thinking and creative problem solving and an ultimate goal of teaching students to succeed in future careers and civic life. Purchase a Newburyport VIP card using the order form on this page, and $10 of your card purchase will be donated to The River Valley Charter School Foundation. “Our motto at Newburyport.com is to Support Local, Shop Small, GO VIP! It reflects our mission to raise money for our local non-profit/community organizations and drive sales for small business owners. We encourage everyone to shop local, helping to stimulate the Greater Newburyport economy, all while enjoying great deals from 180+ local business. Purchase one VIP Card for $25 or two for $40 on the order form below and $10 of your order will be automatically donated to River Valley Charter School Foundation.